To understand the effects of light you'll need a lifetime of observation. Don't be daunted by the last sentence. Be excited that you have discovery ahead of you! Look for the presence of light and how it affects a subject. What most people don’t know…Shadows are where the most exciting color possibilities can be found...not gray! Light is what reveals form, color and texture. It can transform ordinary into something exciting! Look at the shadows. What color do you see? I see green, red and blue. NO GREY! Do the shadows have hard or soft edges? Where? 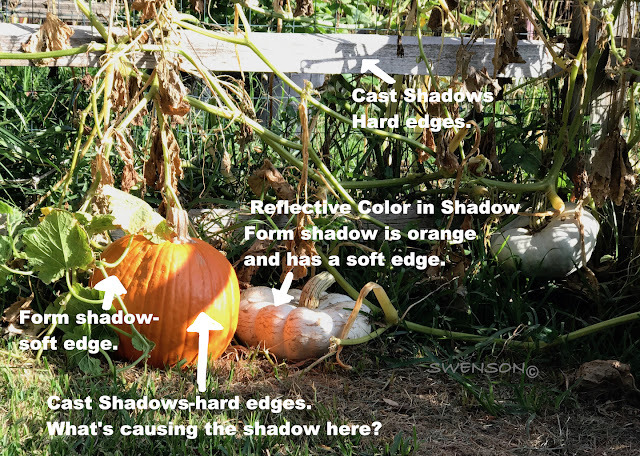 Cast shadows have a distinct hard edge. Cast shadows will suggest the shape of the object that cast it. The further a cast shadow is from the source, the more it is effected by light. As a result a cast shadow will become warmer, and the edges softer and paler. What COLOR do you see in the shadow? Form shadows have a softer, less defined edge. Because a form shadow is turning from the light source. Form shadows are delicate in appearance and important in making a subject appear three dimensional. The form shadow is lighter in value than the cast shadow. (3) Reflective color in shadows. The illuminated area near an object reflects (bounces) light into the shadows which carries color with it. This is called reflected light. You’ll often hear the term Light Theory when talking about light. It simply means supposed to happen or possible…it’s not an exact science. It’s helpful to actually see the effects of light happening. Let me show you what I saw while painting outdoors recently. 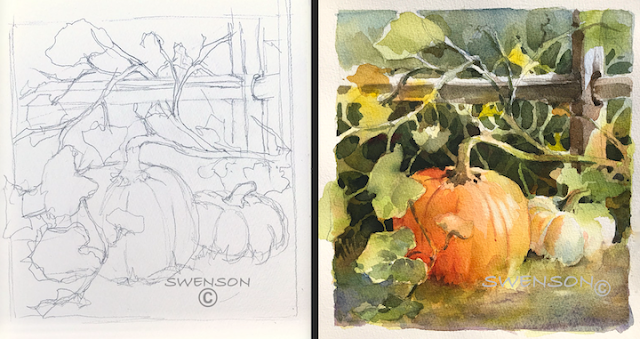 Working en plein air (outdoors) has taught me a lot about light, color, edges...and working quickly to get the essence. I don't record every detail and leave a lot out. 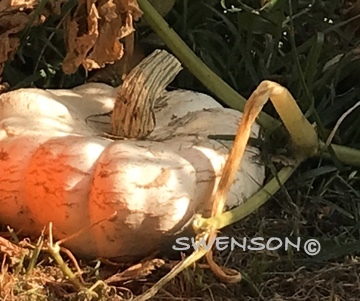 The large shadow across the pumpkin was edited out (yes, I can do that). This is great info; thanks Brenda!! Wonderful article Brenda, very informative! !